oven fried chicken | What's Cooking at the Genua's? I swore I would do the blog in the morning, so that when 7pm rolled around I wasn’t scrambling to get dinner ready and writing my blog at the same time. But here I am at 7:15pm writing the blog. I get so swamped in the morning. Between getting up with my husband at 7am, make his lunch & breakfast for him to take to work, feed the cats, clean the litter boxes, take the garbage out for pickup, do two more loads of laundry, check my email, eBay and whatnot…Oh and I wanted to do my daily walk as well at around 10am. HA! It was noon by the time I did that. So once the morning was gone the thought of writing the blog was too. I spent the afternoon job hunting as usual. No luck. So here I am now writing about a yummy dish I made last night. The original version of this recipe is from Rachael Ray (my fave!) and I changed it to suit what I had in the house. It originally called for 4 chicken legs w/thighs. I had 5 chicken thighs. The recipe also called for removal of the skin! I know! I left it on. That is pretty much it on what I changed. Though next time I am adding more hot sauce. Recipe only called for 1 tablespoon, not enough. I would add about ¼ cup next time. I served it with a side of green beans. The beans were the frozen kind in a ‘steamer’ bag. I was steaming them for about 5 minutes in the microwave till I heard the bag pop! No, it’s not supposed to do that! So I took them out of the microwave. In the meantime I had sautéed a shallot and 3 cloves of garlic in a little olive oil. I drained and dumped the beans into a microwave container and added the shallots and garlic. Then I added about 4 ounces of crumbled light feta cheese. Then I put it all back in the microwave for another minute or so. By then the chicken was done! Whew! So without anymore babbling here is the chicken recipe! 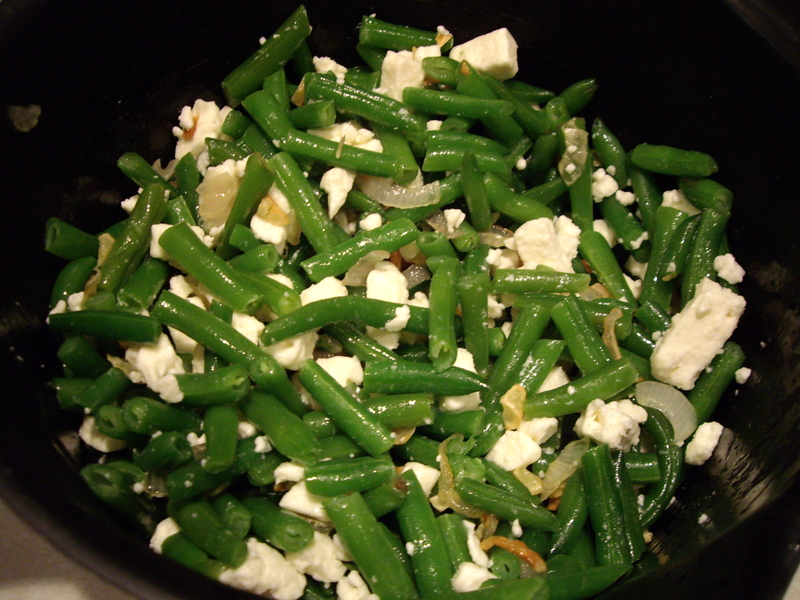 Green beans with shallots, garlic and feta cheese! 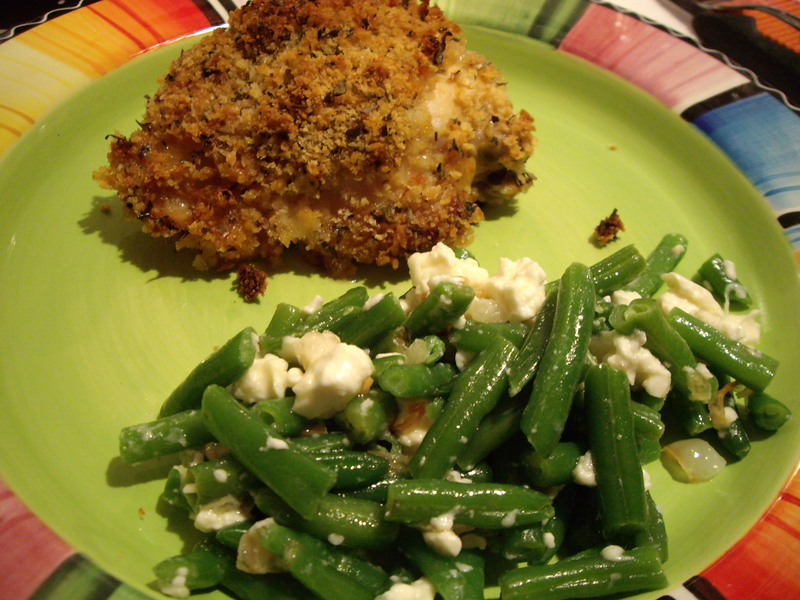 Chicken thigh with the delish green beans! 1. In a large bowl, whisk together the mustard, yogurt and hot sauce. Add the chicken, turning to coat and let stand at room temperature for 30 minutes. If you aren’t ready to cook right away cover and refrigerate for up to 12 hours. 2. Place a rack in the upper third of the oven and preheat to 400º. Line a baking sheet with parchment paper and grease with 2 tablespoons of the olive oil. 3. In another large bowl, toss together the panko bread crumbs and Italian seasoning. Skip this if you have seasoned panko. Add 1 teaspoon salt and ¼ teaspoon pepper to crumbs. 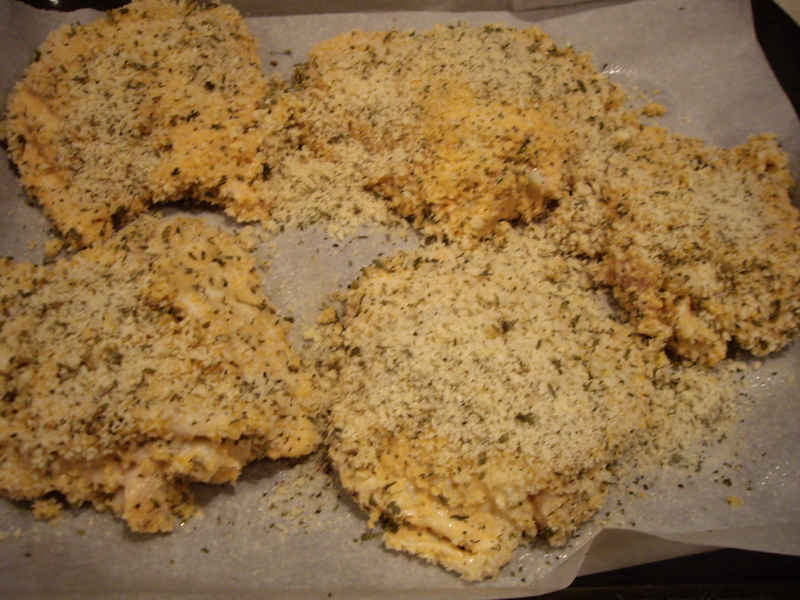 Working with 1 chicken piece at a time, coat in the panko mixture and place on the prepared baking sheet. Drizzle with the remaining 2 tablespoons olive oil and bake until golden brown and cooked through, about 40 minutes. Chicken all dressed up for the oven!